My Scrappy Life: Blog Tour: 300th Post - More than A Novel: A story that makes you think! Blog Tour: 300th Post - More than A Novel: A story that makes you think! It's my 300th post - a milestone of sorts - and to celebrate, I'm reviewing a new book - Enduring Justice - and interviewing the author, Amy Wallace. So grab a latte, keep reading and enjoy! Normally I don’t pick up the third book of a series. It’s kind of like tuning into a television show mid-season, or walking into a movie well after it is in full swing. So I was a bit skeptical when Enduring Justice, part of the Defenders of Hope series, by Amy Wallace landed on my desk. Typically, I would bypass the third book of any series, preferring to “back track” and read the books in the order they were written by the author. But for a variety of reasons, I decided to give Enduring Justice a chance. I found more than a novel as I dived into the pages. Instead I found a book that made me think about some deep issues. Wallace’s novel centers around two key individuals: Hanna Kessler - a photographer, businesswoman and childhood abuse survivor - and Michael Parker, a FBI agent working within the Crimes Against Children division. Enduring Justice concentrates on Hanna’s story. The novel opens with Hanna’s struggle to put life into perspective and with her finally coming to grips with an incident of sexual abuse she experienced before her seventh birthday. Hanna’s world turns inside out when she learns a current case under investigation by Michael, Steven and Clint, directly links back to her childhood abuser. The revelation leads Hanna to confront her abuser more than 20 years after the fact. Wallace’s writing moves fast and incorporate the points of view of several characters – including Hanna, Michael and the villains. The book’s primary setting – Washington, D.C., allows Wallace to explore a variety of political themes including a sub-plot that involves a politician and a group which promotes racists ideology. Through it all, the storyline present in Enduring Justice is gritty, and frankly, a bit raw. It’s definitely not the easiest book to read, which Wallace admits is a deliberate choice. She is unapologetic concerning her choice to write a novel with a deep, disturbing subject. “I’ve been told my stories aren’t comfortable to read,” Wallace writes in her author’s note. “In some ways, that makes me smile. Because it’s when I’ve been nudged out of my comfort zone that my understanding of God is deepened. Through these stories, Wallace continues, she hopes to remind people who have found hope and healing to “reach out a hand” to help others who are hurting or in pain. I’m glad I made an exception to pick up this book. It allowed me to discover a new (to me) author, and a new Christian suspense series. While romance is a sub-plot in the story line, it is not included in an unrealistic way. While the book wasn’t an easy read, it did provide me with something to think about. It also makes me want to find the earlier books – to see how Wallace developed the Defenders of Hope series through the eyes of Steven and Clint. Want to find out more about Wallace and her books? Check out her website at www.amywallace.com. 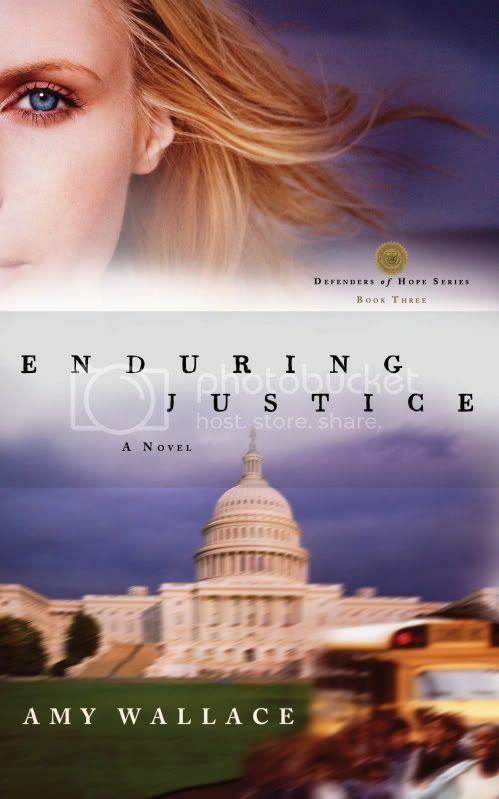 Want to read an excerpt from Enduring Justice, visit http://amywallace.com/pdfs/Enduring_Justice_chs_1_and_2.pdf and download a pdf of the first two chapters. Additional information about the Defenders of Hope series can be found at http://www.defendersofhope.com. Amy Wallace likes to joke that she was “shoved” into writing by two people – God and her husband – through a series of incidents. In response to her enthusiasm - Wallace even developed a story for one of the author’s secondary characters – she found her husband encouraging her to write her own novel. She told her husband about the dream – and he immediately helped her quest by setting up an interview with a federal agent he had met. “I was hooked,” Wallace continued. “By the time I met with the federal agent, I had a decent sketch of a story plot. We met and brainstormed for an hour. Wallace likes to integrate suspense, faith and romance into her novels for a variety of reasons. Faith, she said is integral to her novels, because Christianity frames her understanding of life. She said romance and suspense also help build an exciting story that leaves her, as a reader and writer, satisfied. The genesis of the Defenders of Hope series began, as Wallace watched the Twin Towers fall in New York on Sept. 11, 2001. “I sat glued to the TV for weeks, watching the firefighters, police officers and FBI help us recover as a nation, help us remember what it means to be an American and what heroes really look like,” Wallace said. “I wanted to do something to give back. Wallace chose to center the series on agents working in the Crimes Against Children Unit – a real unit which strives to keep America’s children safe from child predators. A CACU unit does work out of the Washington, D.C., area. Additional agents are stationed in each of the FBI field offices. Wallace said in many ways, she was working through her deepest fears as a mother, as she developed and wrote the Defenders of Hope series. 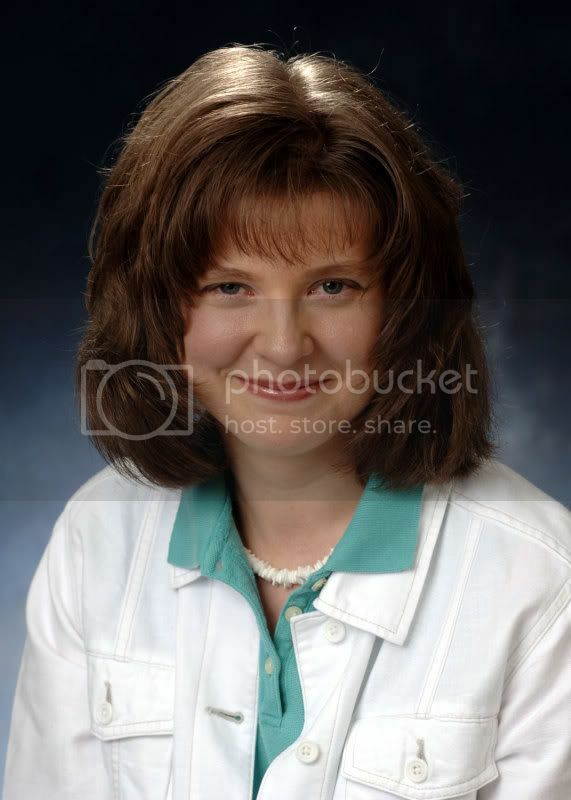 Wallace said she relies upon, and integrates her counseling background – she has a bachelor’s degree in counseling and guidance from the University of Louisville - throughout her manuscripts. “A counseling background comes in handy for understanding what drives humans and their fictional counterparts, as well as being able to show cause and effect for how our past shapes our future,” Wallace said. “What we believe about ourselves and others drives everything we do. As the third book in the Defenders of Hope series, Wallace said Enduring Justice went through four fully researched outlines before she and her editor found a storyline that worked. Wallace said a lot of her personal experience – especially the feelings of shame and hiding - found its way onto the pages, as part of Hanna’s story. “It took five years for me to talk about being raped, and even then I felt so much shame and imagined blame that I still didn’t share my experience with many people at all,” Wallace continued. “From others, I knew that was a common thread among women who’ve been abused. Through it all, Wallace hopes that people look beyond Enduring Justice’s exciting story, to find a deeper meaning. “I pray that … readers will look deeper into what they believe about God, themselves and others, what forgiveness really looks like, and that they’ll also wrestle with the truth that God is good even when life isn’t,” Wallace explained. “In addition, I pray that these stories will put flesh on the struggle with forgiveness, the lies we believe and how healing is a choice. Wallace jokes after three novels, it’s time to give Steven, Gracie, Clint, Sara, Michael and Hanna, a time of peace and rest. “I’m at various stages with three other suspense projects and excited about sharing more stories that showcase hope and healing and wrestling with deep truth,” she said. “I love writing stories, teaching teenagers, scrapbooking, playing basketball and hiking with my family,” Wallace said. “The beach is my all-time favorite place to be. Chocolate is my favorite food. I collect teddy bears, tons of books and dust on my furniture. Wallace said she finds encouragement through readers’ comments on her Dark Chocolate Suspense site – www.amywallace.com. Amy Wallace is a freelance writer and self-confessed chocoholic. She is a graduate of the Gwinnett County Citizens Police Academy and serves as the liaison for the training division of the county police department. Amy is the author of Ransomed Dreams, the first book in the Defenders of Hope series, and a contributing author of several books including God Answers Moms’ Prayers, and God Allows U-Turns for Teens. She lives with her husband and three daughters in Georgia. Enter to win all THREE BOOKS in the DOH series by signing up for Amy’s Dark Chocolate Suspense Newsletter and then leave a comment on this blog tour post (http://peek-a-booicu.blogspot.com/2009/04/enduring-justice-blog-tour.html). It’s chock full of insider info on the writing world, a thought-provoking devotion, and easy but yummy recipes. If you already subscribe to the newsletter, just leave a comment saying so on the blog tour post! The winner will be chosen at random on 5/8/09. Two runner's up will also be chosen to win a copy of Enduring Justice. Congrats on your 300th post! I'm honored to be part of it. Thank you for taking the chance on Enduring Justice and finding in the pages much to think about. I appreciate your review and was really impressed with your interview. You did an amazing job~ thank you! Jon & Kate Plus Eight - a few thoughts.